In 1908 E. W. Marland came to Oklahoma after losing his fortune in the Pennsylvania oil fields in the panic of 1907 and by 1920 had reestablished himself and started the Marland Oil Company and building the Marland Refinery in Ponca City. 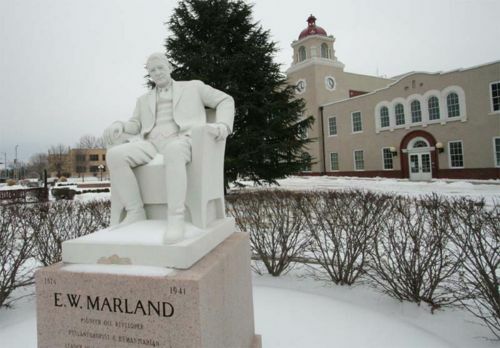 Marland was a visionary and not only pioneered the use of geophysical techniques in the oil industry but was years ahead of his time as an employer providing housing, loans, medical care, and other benefits for the thousands of employees who worked at his refineries and pipelines. The refinery EW Marland built in Ponca City in 1918 has provided employment, opportunities, and benefits to tens of thousands of citizens of Northern Oklahoma in the almost 100 years since the Marland Refinery in Ponca City was built. 1.3 Proposal to Rename Phillips 66's Refinery to the "Marland Refinery in Ponca City"
See also How Much Money Does the Marland Refinery in Ponca City Earn for Phillips 66? Rod Walton writes in the Tulsa World on April 28, 2012 that with the spinoff, Ponca City may not be affected as dramatically by the split as Bartlesville. Going back to the 2002 merger shows that Bartlesville and Ponca City were affected differently leaving the two cities in different situations today." Conoco employed nearly 1,900 people in Ponca City at the end of 2001, while Phillips had a workforce of 2,500 in Bartlesville. The ConocoPhillips numbers shrunk to only 750 refinery workers in Ponca City but swelled to 3,500 at the shared services center in Bartlesville. Ponca City is now purely a refining town, with Ponca City having lost all 750 non-refinery jobs during the three-year repositioning plan. "Today, we're a refinery town," said David Myers, executive director for the Ponca City Development Authority. "No doubt about it: the merger was not kind to Ponca City." "The dark humorists in that city used to joke that Ponca City got the first name in the merger but little else," writes Walton. "ConocoPhillips opted to shut down a carbon fibers plant early on and eliminated the rest of the 750 non-refinery jobs beginning in 2009."" The Bartlesville Examiner-Enterprise editorialized on April 29, 2012 that Jim Mulva has "proven to be a true friend to the City of Bartlesville." According to Rod Walton, Bartlesville was a big beneficiary of the ConocoPhillips merger and seems to have lived a charmed life economically over the past ten years. Although the home of Frank Phillips doesn't employ 9,000 company workers as it did in the early days, the 1,000 employees added since 2002 have kept downtown buildings such as Plaza and Adams full of mid-level computer, credit and other support personnel. But now Bartlesville operations are in flux and there is much uncertainty about the future. "All employees are being moved to one of the two companies, with co-workers who once sat side to side now literally shifted to separate buildings," writes Walton. ConocoPhillips will employ about 1,700 people in the downtown Plaza and Frank Phillips Tower Center buildings and in the Adams warehouse. Phillips 66's Bartlesville workforce will number 1,900 people, housed in the main Adams and Phillips buildings and the Research and Development Center on the west edge of the city. The Bartlesville Examiner-Enterprise reported on April 29, 2012 that the "split or 'repositioning' as it has been called by company officials, has required many existing local employees to shift jobs and even physically move from one building to another within the extensive downtown Bartlesville office complex" adding that "while no one can predict the future with perfect clarity, Bartlesville appears no worse for the wear during this complex process." ConocoPhillips CEO Ryan Lance and Phillips 66 CEO Greg Garland reassured its employees in Oklahoma in an op-ed they wrote for the Bartlesville Examiner-Enterprise titled "ConocoPhillips, Phillips 66 have deep roots in Bartlesville" that "ConocoPhillips and Phillips 66 together employ nearly 4,500 people in Oklahoma, an increase in recent years. Going forward, we will both maintain Global Services Centers in Bartlesville providing essential finance, information technology and other vital support to our personnel around the world. Elsewhere, Phillips 66 will continue operating the Ponca City Refinery, by far Oklahoma’s largest, and will remain the leading gasoline marketer. ConocoPhillips will continue producing oil and natural gas from the Anadarko Basin and the Panhandle area." Lance and Garland added that "we continue encouraging both current and incoming employees to maintain our proud tradition of community service. Bartlesville is a special place to work, live and raise a family, and we want to help keep it that way. This is an exciting time for ConocoPhillips and Phillips 66. All of our Oklahoma communities are great homes to our people and businesses, and we both look forward to long and bright futures here." "The Phillips and Conoco merger has taught everyone, Poncans and Bartians alike, to simply expect the unexpected," writes Walton. "In other words, who knows what ConocoPhillips and Phillips 66 will look like 10 years down the road?" "We do have a strong Conoco retiree group that lives here," says Dave Myers. 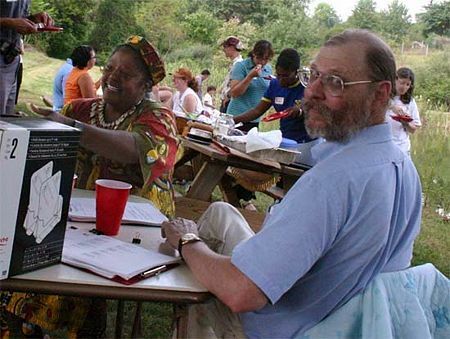 "There's still talk in the community, still those who'd like to go back to the old days. I think most people have moved on." On March 27, 2012, the Ponca City News reported that leaders from Phillips 66 visited Ponca City and were met by community leaders. On the Phillips 66 side were Bob Herman, Future Lead of Health, Safety and Environment; Pete Stynes, Ponca City Refinery Manager; Larry Ziemba, future Lead of Refining, including Projects and Procurement, and President, Global Refining; Chantal Veevaete, future Human Resources; and Tim Taylor, future Commercial, Marketing, Transportation and Business Development. On the Ponca City side were City Manager Craig Stephenson; Lee Evans, Chair of the Ponca City Area Chamber of Commerce; David Myers, Ponca City Development Authority; Rich Cantillon, Chamber of Commerce/Tourism Bureau; Carl Renfro, community leader; and Larry Murphy, Chair of the Ponca City Development Authority. Phillips 66 CEO Greg Garland, although originally scheduled to visit Ponca City with his management team, was not able to attend. Ponca City Mayor Homer Nicholson, retired from ConocoPhillips after 38 years service, was also unable to attend. Proposal to Rename Phillips 66's Refinery to the "Marland Refinery in Ponca City"
On March 12, 2012 a web site was created asking the management of Phillips 66 to consider honoring EW Marland, the oil pioneer who built the refinery in 1919 and developed the oil industry in North Central Oklahoma by restoring the name of the Phillips 66 refinery in Ponca to its original name, "Marland Refinery in Ponca City," as a gesture of goodwill to the community of Ponca City. "The Ponca City News" recently announced that with the split of ConocoPhillips into two companies, the ConocoPhillips operation in Ponca City, Oklahoma will soon be renamed Phillips 66. Frank Phillips, the founder of the Phillips 66 Oil company, was a man who knew how to use his courage and initiative and great administrative ability to create industry and wealth in Oklahoma leaving a legacy in the oil company that bears his name that will always be a monument to his memory. But there is another Oklahoma oil pioneer who was equally important in developing the oil industry and bringing prosperity and advancement to Northern Oklahoma and that man was EW Marland. EW Marland pioneered the use of geological techniques in the oil industry and was years ahead of his time as an employer providing housing, loans, medical care, and other benefits for thousands of employees who worked at his refineries and pipelines but Marland lost everything to the powerful JP Morgan banking interests - even losing his name on the oil company that he founded in Ponca City. It is altogether fitting and proper that Phillips 66 honor the heritage of oil development in Northern Oklahoma by recognizing Frank Phillips and EW Marland. The executives of Phillip 66 have honored the memory of Frank Phillips by choosing to name their new company for Phillips. We think Phillips 66 should honor the legacy of oil pioneer EW Marland by naming their refinery in Ponca City for Marland, the man who started the refinery and brought advancement and development to North Central Oklahoma. 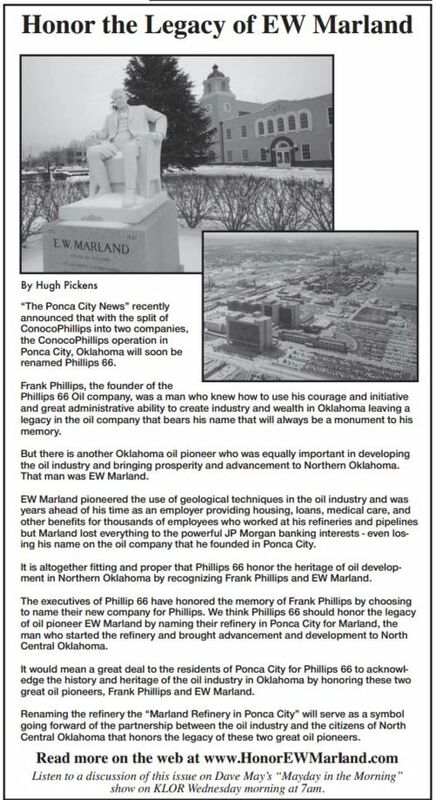 It would mean a great deal to the residents of Ponca City for Phillips 66 to acknowledge the history and heritage of the oil industry in Oklahoma by honoring these two great oil pioneers, Frank Phillips and EW Marland. Renaming the refinery the "Marland Refinery in Ponca City" will serve as a symbol going forward of the partnership between the oil industry and the citizens of North Central Oklahoma that honors the legacy of these two great oil pioneers. A full page advertisement by Phillips 66 announcing its "intent on continually earning the trust of the communities we serve and operating with the highest levels of integrity" appeared in the Ponca City News on May 1, 2012. A quarter-page advertisement congratulating Phillips 66 on its creation and asking Phillips 66 to honor the legacy of EW Marland appeared in the Ponca City News on May 1, 2012. ↑ Ponca City News. "Honor the Legacy of EW Marland" May 1, 2012. ↑ Ponca City News. "Honor the Legacy of EW Marland" May 19, 2012. ↑ Tulsa World. "ConocoPhillips streamlines with Phillips 66 refining side spinoff" by Rod Walton. April 29, 2012. ↑ Tulsa World. "ConocoPhillips split is deja vu for Ponca City, Bartlesville" by Rod Walton. April 29, 2012. ↑ Bartlesville Examiner-Enterprise. "CEO: City strategic to Phillips 66" by Jessica Miller. September 13, 2012. ↑ The Ponca City News. "Future Phillips 66 officials visited the Ponca City site last week" March 27, 2012. ↑ Ponca City News. Phillips 66 Advertisement. May 1, 2012. This page was last modified on 22 April 2014, at 13:22.